Goodreads: After Andi Gordon is jilted at the altar, she makes the most impetuous decision of her life – buying one of the famed Three Sisters Queen Anne houses on Blackberry Island. Now the proud-ish owner of the ugly duckling of the trio, she plans to open her own pediatric office on the first floor, just as soon as her hunky contractor completes the work. Andi’s new future may be coming together, but the truth is she’s just as badly in need of a major renovation as her house. When Deanna Phillips confronts her husband about a suspected affair, she opens up a Pandora’s Box of unhappiness. And he claims that she is the problem. The terrible thing is, he’s right. In her quest to be the perfect woman, she’s lost herself, and she’s in danger of losing her entire family if things don’t change. Next door, artist Boston King thought she and her college sweetheart would be married forever. Their passion for one other has always seemed indestructible. But after tragedy tears them apart, she’s not so sure. Now it’s time for them to move forward, with or without one another. Thrown together by fate and geography, and bound by the strongest of friendships, these three women will discover what they’re really made of: laughter, tears, love and all. Ope’s Opinion: Susan Mallery hit another home run! This book read so fast! The story of all three women were relatable and fast moving. It was great to see each woman’s story move forward in each chapter. It made it seem more like real time. The intimate details of the romance is my least favorite part, but at least each woman was with only one man. They were real relationships with flaws and heart felt struggles. As you read, you will want each woman to be happy at the end. You can’t help but route for them. I want more of the Blackberry Island books! This may be my favorite Susan Mallery book to date. So keep writing! Rating: Four Chairs – I like the book so much I know several friends to share it with. 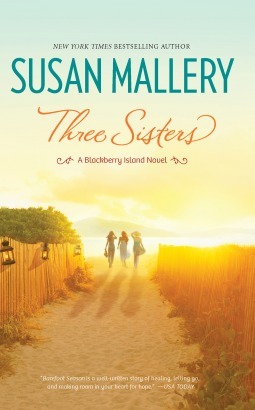 This entry was posted in Book Opinion, Uncategorized and tagged book review, books, Susan Mallery by opesopinions. Bookmark the permalink.